Applications – Works with a fluoresence microscope, 96 well plate reader, or flow cytometer. 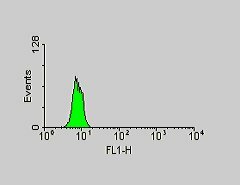 Cell Technology ’s APO-ACTIVE CASPASE 3 Kit utilizes a rabbit affinity purified polyclonal antibody raised against amino acid 163-175 of murine caspase 3 (9). This neo epitope is present on the p18 subunit of cleaved caspase 3 (9). Cells undergoing apoptosis are fixed and permeablized prior to the addition of the antibody. 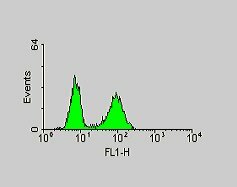 A secondary FITC labeled goat anti rabbit antibody is used to visualize the bound rabbit anti caspase 3 polyclonal. Fig (A). Jurkat Cells were stimulated with DMSO for 2 hours. The cells were washed and fixed for 15 minutes. The cells were then permeabilized with saponin and stained with Rabbit anti active caspase 3 antibody for 1 hour. The samples were then stained with PE labeled Goat anti Rabbit antibody. Fig (B). Jurkat Cells were stimulated with staurosporine for 2 hours. The cells were washed and fixed for 15 minutes. The cells were then permeabilized with saponin and stained with Rabbit anti active caspase 3 antibody for 1 hour. The samples were then stained with FITC labeled Goat anti Rabbit antibody.